Ramco Institute of Technology, Rajapalayam has advertised in THE HINDU newspaper for recruitment of Principal job vacancies. Interested and eligible job aspirants are requested to apply with in 28th April 2018. Check out further more details below. 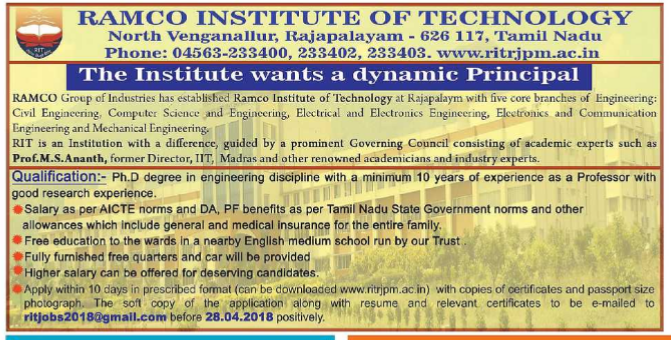 About College: Ramco Institute of Technology is founded with a vision to impart high quality engineering education at an affordable cost. Under the able guidance of our Chairman – Shri P. R. Ramasubrahmaneya Rajha, son of Shri P A C Ramaswamy Raja; distinguished professionals, academicians and education experts, we continually aim to revolutionize the learning environment by creating an enviable knowledge pool of engineering and technology graduates who are attuned to the current industry requirements. Ph.D degree in engineering discipline with a minimum 10 years of experience as a professor with good research experience. 1.As per AICTEPCI norms and DA,PF benefits as per tamilnadu state govt norms and other allowances which include general and medical insurance for the entire family. 2. Free education to the wards in a nearby English medium school run by our trust. 3. Fully furnished free quarters and car will be provided. 4. Higher salary can be offered for deserving candidates. How to Apply: Apply with in 10 days in prescribed format(can be downloaded www.ritrjpm.ac.in) with copies of certificates and passport size photograph. The soft copy of the application along with resume and relevant ceritificates to be e-mailed to ritjobs2018@gmail.com before 28-04-2018 positively.